I’m going to make this one short and sweet: This comic rocks. For those of you who want more specifics, I’ll continue, but rest assured, the end result will be the same. 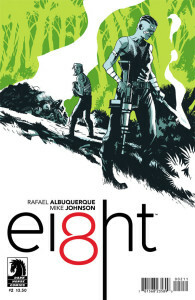 Ei8ht is one of my favorite looking comics out right now. I absolutely love the aesthetics of what’s happening in the pages of this one. Granted, I’m a bit biased by being a fan of Rafael’s art since I first became aware of it in the pages of American Vampire, but still… this thing looks great. It’s not just the line art, but it’s that limited color palette Rafael is using to help tell this tale. It’s fantastic. I know I talked about it in my review of issue #1, but damn, this thing still looks good. And that limited amount of red used really makes those pages pop. But this is more than just a good looking book. The story is more than holding up its end of the bargain. I’m so down with this time hopping sci-fi fantasy adventure it’s crazy. I’ve said it before that good art can help elevate a passable story. Of course, bad art can also drag down the coolest of stories. But in this case, the visuals are as much a part of the story as the dialogue or characters or setting. It’s a very integrated piece of storytelling where every element is carrying its weight effortlessly. I really dig the slow burn reveal of Joshua’s memories as he pieces together his original mission. It’s a cool way to reveal to us as readers what Joshua’s backstory is as he relearns it for himself. I’m also digging The Meld itself. The collection of miss matched people, places, and things just sort of slam banged together and being forced to eek out an existence. And the time hopping nature of the story telling, you know I dig that. Mike and Rafael are serving up a unique story, with a unique setting, in a unique way. That’s a lot of unique in one story. And it rocks.